Motorola has started rolling Android 5.1 Lollipop for Moto E 2nd Gen ( Surnia ) users in India . Users of Motorola Moto E 2nd Generation can now update their Smartphones to Android 5.1.1 Lollipop . 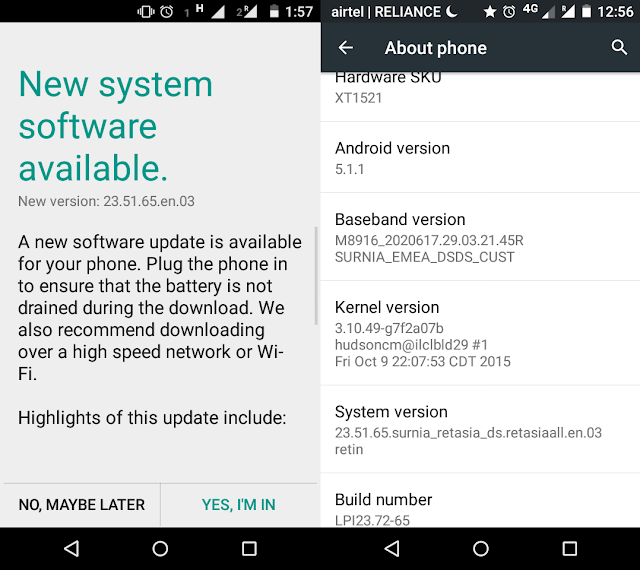 The Lollipop 5.1.1 update is now seeding for Indian users of Moto E 2nd Gen in Phases . Many users have already reported to get Android 5.1.1 Lollipop update . Users reported that it is not soak test ( as soak test was over last week ) . The update is of 402.2 MB and is available for Moto E 2nd Generation users running on Android 5.0.2 Lollipop . Step 1. You should be on Locked Bootloader and Stock Official 5.0.2 firmware to receive the update . Step 2. Reboot your Moto E 2nd Generation . Step 3. Go to Settings > About device and Software update . Step 4. Now follow the steps and Install Android 5.1.1 OTA update .